My review of last week's episode: Elephants Can Remember. It's practically a fact of nature that if you're cooped up with a number of people in a house in the snow, someone will be dead by the end of the weekend. If a small rotund Belgian man is there, you might as well call up friends (after calling your family solicitor) and say goodbye. The story begins with a police operation to catch thief Marrascaud. Organized by Poirot, the plan goes disastrously awry, resulting in the death of a beautiful young woman and the theft of, among other things, the last of a series of paintings known as the Labours of Hercules. Depressed, robbed of his raison d'être, Poirot attempts to redeem himself by assisting a young chauffeur find his lost sweetheart. The search takes him to an isolated mountain-top hotel (it's named Olympos, as it happens) in Switzerland in which he soon finds himself, inevitably, snowed in. But that hardly results in boredom, for all sorts of criminal behavior is going on behind the scenes. There's a sinister German psychologist played by Simon Callow ("Ve're not all Nazis"), a sensuous Russian ballerina, a straitlaced Englishman, a damsel in distress and her over-protective companion, and if these are starting to sound like types well it's Agatha Christie. Oh, yes, and one of them is Marrascaud. As the penultimate episode, Labours appropriately taps into themes of regret, justice, mercy, and purpose in a way that superbly sets the stage for Curtain. Countess Rossakoff (Orla Brady, ably standing in for Kika Markham) and her intelligent, smug daughter Alice, is one more reminder to Poirot of what he might have had if he was not, well, Poirot. If he can still fail, what is the point of seeking justice? Like The Big Four, Labours has some fun picking at Poirot's habits, but there's a serious question here. Poirot's arrogance is funny, but is it also dangerous? Poirot's devotion to rule of law is admirable, but what has it cost him? Was it all worth it? The episode has a cynicism that undercuts the comforting certainty that always comes after Poirot's twenty-minute whodunit explanation. J.R.R. Tolkien once wrote "I am a Christian, and indeed a Roman Catholic, so that I do not expect 'history' to be anything but a 'long defeat'—thought it contains...some glimpses of a final victory." A fellow Catholic, Poirot seems to agree. While we are no longer in The Golden Age that Agatha Christie symbolized, it is not a completely hopeless future. Poirot settles for a certain justice, and that is enough for now. And another thing: it was fun. 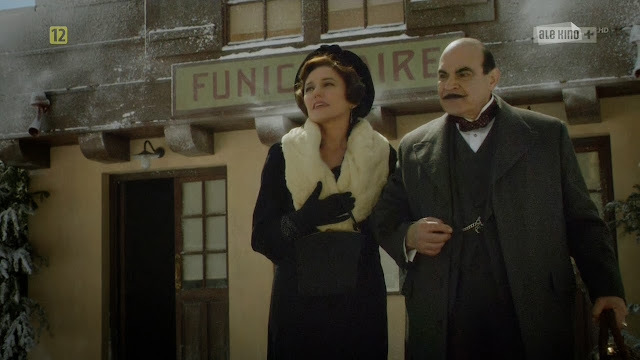 Which is why, accompanied by David Suchet's marvelous (as-ever) performance, Orla Brady's lovely countess, a clever, intense solution, the breath-takingly singular location, the hilarious maître d', and the clever foreshadowing, I give it my highest rating. I watched this the other evening, and I enjoyed it so much! It's a new favorite. Spectacular episode. It's just sad the series is over. The villain was great, even though I greatly suspected that character--it only added to the anticipation. I'd definitely put this villain near the top, alongside the ones in After the Funeral and Peril at End House.